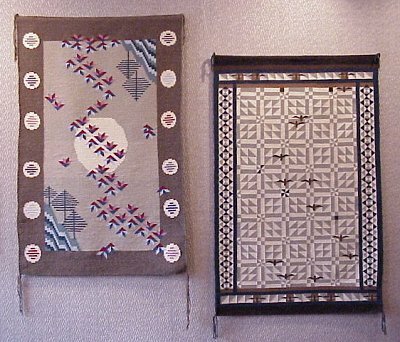 This exhibit features eight Navajo-style rugs by Madeline Quigley. Since 1977 Madeline has woven 22 rugs sized approximately 44 X 64 inches. In 1986 she had her first show at L'Etoile Restaurant in Madison, WI. Madeline is currently employed full time as a Library Technician at Steenbock Library, University of Wisconsin-Madison. She continues to weave in her free time and is currently working on a new, larger loom. The rugs on display have been generously lent by the artist, Madeline Quigley, also by Arlene Norris, Edie Dixon and John Devereux who has been collecting rugs since 1991. My fascination with weaving began in 1976 in Los Angeles, in a survey course on tapestry weaving, in which the Navajo style of weaving was presented. Immediately I knew I wanted to learn the Navajo technique. I bought a Navajo style loom and a book called "Working With the Wool: How to Weave a Navajo Rug", by Noel Bennett and Tiana Bighorse. I wove two small rugs, and I still turn to that book today. 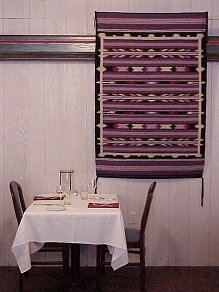 In 1977, I returned home to Madison and fortuitously found Fran Potter (the Dining Room featured a display of Fran's rugs in 1998), a teacher of Navajo weaving. Her passion and expertise nurtured my own growing love and excitement for this technique. Under her tutelage, I progressed to a larger loom and continued learning, weaving several rugs of traditional Navajo design. traditional Navajo design remains the greatest influence. In any single rug, you may see one or all of those themes at work. Creating the design, selecting the colors, and warping the loom is the most challenging part of the process, but once the loom is prepared I am ready to begin the act of weaving. This is the most rewarding time for me. Moving weft through warp, beating the weft, feeling the comb in my grasp, and watching the design build upward on the loom, are what I love most about weaving and what draws me back to the loom every day. The Navajo loom is the primitive vertical loom used by the Navajo Indians. The warp is wound in a figure eight around two horizontal bars. These two bars are then stretched apart in tension simply by being tied to floor and ceiling or to a specially built frame. A shed rod is placed under every other warp thread, and remains there to form one shed. The other shed is formed by pulling forward a heddle stick to which the alternate warp threads are attached by string loops. A few tools fashioned out of hardwood are used with the Navajo loom. The batten, a smooth flat stick, is inserted in the sheds and turned on edge to hold the shed open, leaving the hands free to work with the weft. Battens of smaller widths are needed to complete the last few inches of weaving at the top, when it becomes increasingly difficult to open the sheds. A wooden fork is used to pack the weft into place, and occasionally the batten is used to beat the weft; this helps to promote an even line in the weaving.